After a period of frankly perfect hillwalking weather I wasn't surprised when, three days prior to the meet starting, I received an email from Allan and Kate saying they were already at the bunkhouse and enjoying the hills! Everyone arrived in dribs and drabs on Friday night; apart from Harry that is, he had apparently got the petrol and diesel nozzles mixed up at the garage? It was a lively crowd around the little table on Friday night - to be expected I suppose when there is a bunch of Glasgow Girls (and Monty), Ian Ezzi after a break of two years; and more new members than you can shake a stick at. An interesting game of musical circuit-breakers was invented as a kettle in the kitchen flipped the electrics. The next day I in particular (a non-tea/coffee drinker) observed with interest some of the faces of those clearly struggling without their morning fix (Pauline; Antti) and once the electricity was restored a huge trough of water went on to boil. New member Lorna was forced to make her porridge in a frying-pan. On Saturday the group was split in two: those that know Alison Fleming and those that don?t. 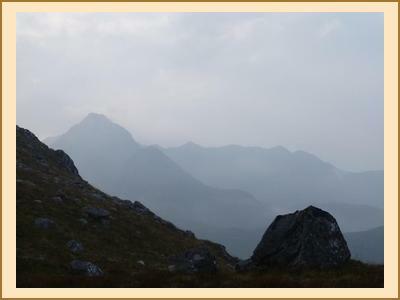 The ones that do headed to the Saddle for Alison?s last Munro; a fantastic choice of hill given the calm conditions although the view was impeded by a haze that made everything ?fuzzy?. Mike, Fiona and Ian L joined in and there was much fun to be had on the scramble of the Forcan Ridge. There was pink bubbly stuff in abundance and tray bakes at the trig point after a debate over the location of the actual summit. 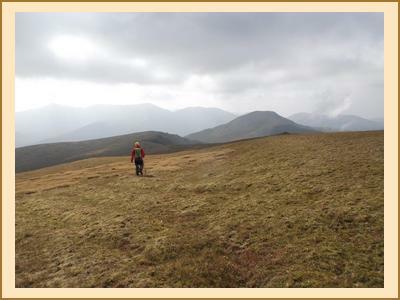 It turned out that the hill was also Alison?s mum?s last Munro. An impressive feat indeed (although it was also her first?!). Many of the party headed back down the same way; some went over to Sgurr na Sgine and down the knee-crunching ridge of Faochag; Mike and Fiona bagged some tops, completing a circuit of the Saddle horseshoe to the west. There was a posh dinner at the Kintail Lodge to top off the day, with an amazing cake! The group who had gone up to Achnasheen were rewarded with atmospheric conditions on Beinn Liath Mhor (and deer keds) and Ian E went for a refreshing dip in a pool on the descent from Fuar-Tholl. With the exception of Monty and Ian, who stayed in their slippers and kept the bunkhouse warm, there was a trip to the Plockton Inn which received good reviews. It was amusing for the other group to return to the bunkhouse and find the ?youth? already in bed. Lorna pointedly remained in her jimjams until 5 mins before check-out time; the others left in the same dribs and drabs they'd arrived in. Chris and Katrina had a fantastic day on Skye - Katrina's ridge initiation - walking up from Sligachan into Coire a?Bhasteir, contouring to Bruach na Frithe and working their way back east along the ridge, climbing Sgurr a'Fionn Choire (not worth the time), the Basteir Tooth via Naismith's Route (a straightforward climb in a sensational position) then up Am Basteir and along the West Ridge of Sgurr nan Gillean. There was spontaneous giggling, although it?s not clear which of them was responsible for that, and by the time they reached Gillean the mist and haze had cleared. A bit of pottering and some casual dinner-ing later, they didn?t get home until after 2am. Carla ? in training for her next marathon - went for a run. Kate, Alan H and Allan S headed for Sgurr an Airgid above Loch Duich before heading home via tea and coffee. I have christened them the Snow Whites after attracting not only sea eagle but also golden eagle on their trip. Newbies Lorna, Sive and Rachel were last seen heading for Skye and hired bikes to cycle to Loch Coruisk. Philip also went Skye-wards and scared himself silly on the Clach Glas-Blaven traverse, for the second time. Antti and I went up Moruisg and ?his little friend? Sgurr nan Ceannaichean, losing a litre of sweat on the trog up the slope, finding a print from the one-legged badger from the sky near the summit of the Munro (where had he come from and was he bagging Munros too??). We agreed with the consensus that is that SnC is the more charismatic of the two hills. I had a paddle in the burn and insisted on a cleansing swim in a loch before the long drive home. A great weekend, thanks all; and well done again Alison!